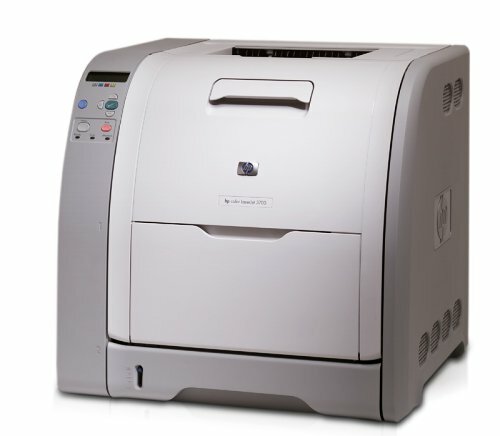 Similar in appearance and function as the Color LaserJet 4700, the 2004 HP LaserJet 3700n is a single-pass color laser printer that can print color prints as fast as black & white at 16 pages. Four models give you the flexibility to choose the printer best suited for your office. There are four variations in the LaserJet 3700n series: The basic 3700, the network-ready 3700n, the 3700dn with Ethernet and duplexer, the 850-sheet capacity 3700dtn. The network, memory, and extra paper tray are available as optional accessories and can be easily added to any printer with no more than a screwdriver. Most businesses will start with the 3700n model and upgrade from there. Weighing in at a hefty 73 pounds, 3700n will take up a 20” x 18” footprint on a sturdy table or printing kiosk. With a minimum height of 18” (taller with the extra paper tray), you want to have plenty of headspace. The LaserJet 3700n comes standard with a 250-sheet cassette tray, capable of holding over a half-ream of letter or legal-size paper. For more capacity, an additional 500-sheet cassette can be stacked to bring the total printing capacity to 850 pages. The flip-door on the front of the printer reveals a 100-sheet multi-purpose tray that can handle transparencies, labels, post cards, envelopes, and to 8.5” x 14” legal paper of various bond weights up to 43 pounds. Using an instant fuser-on technology, the LaserJet can go from sleep to print in 20 seconds. The LaserJet 3700n can print up to 16 pages per minute, be it B&W or color. 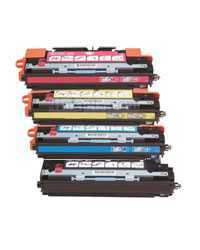 Single-pass color printing allows color print speeds to be almost as fast as many monochrome laser printers in its time. To achieve the 2400 x 2400 color resolution HP utilizes a technique where each dot in the native 600 x 600 dpi contains 4 colors. Think of it like having a whole pie then cutting it up into 4 smaller pieces. At the maximum print resolution text is reasonably sharp, and photographs are very detailed with smooth color transitions. If you want to print in B & W, the printer software will allow for you to only use the black toner, saving on color toner. In addition to Ethernet, the LaserJet 3700n also has a Parallel port interface, and the slower USB 1.1 socket. With a loudness of only 49dB, this is one of HP’s quieter color lasers. The built-in 124MB of printer memory can be expanded up to 448MB, enabling the LaserJet 3700n to easily handle workloads as a high-volume network printer. Understanding the needs of graphic designers, PostScript 3 print emulation is included along with HP PCL5e, and PCL6. When introduced in 2004, 16 ppm color printing was fast. Two years later the HP LaserJet 4700 almost doubled that at 30 ppm. 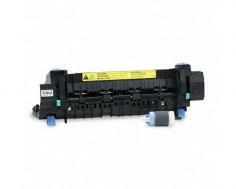 If you are looking to invest in a refurbished color laser, you might want to opt for the color LaserJet 4700.
Review it: "HP Color LaserJet 3700n "
Toner and drum are both accessible from the front panel, eliminating the need to have to move the printer to replace consumables. Out of the box, HP includes standard 6,000-page yield toner cartridges. Of course those numbers are based on official standard of “5% ink coverage per page”. To give you an idea of what that mean’s: 5% is the amount of toner to print a business letter, a printout of a news webpage will need 10% ink coverage; a newsletter 30%, and a print with graphics, text, and photos can exceed 60% coverage. Other consumables you’ll need to consider is replacement of the Image Fuser and the Image Transfer units every 60,000 images.